Ask the iTunes Guy: Should you re-rip your CDs? Sometimes, what seems like a good idea turns out to have unexpected consequences. One reader wrote in about album art that wasn’t syncing to his iOS devices, and had a surprise when he found out the reason. Another wonders whether it’s worth re-ripping songs ripped from CDs more than ten years ago. 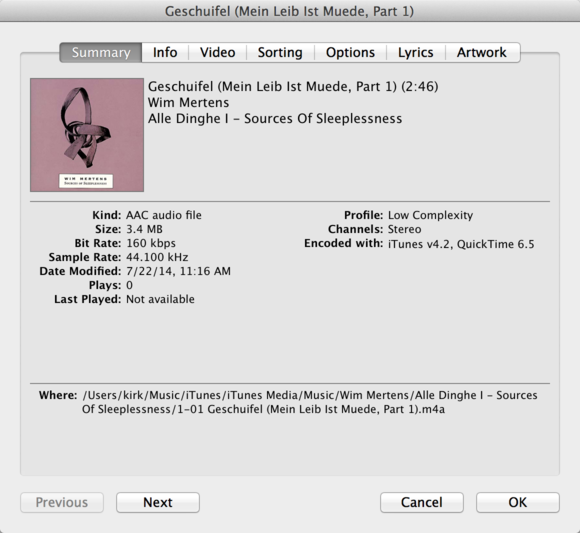 And another reader is looking for a way to save Internet radio stations in iTunes. In this week’s column, I have answers to all those questions. Q: I ripped a bunch of CDs of Bach cantatas, carefully scanning each of the CD sleeves to add the artwork to my tracks. It displays correctly in iTunes, but not on my iPhone or iPad. All my other artwork shows up on my iOS devices; what might be wrong? The reader who submitted this question sent me one of his files to examine. I found that the artwork was very large; it was 2,900 pixels wide, and took up 14MB. This seemed suspicious, so I did some tests, which I explain in detail in this article. The short answer is that iTunes seems to have a limit of around 10MB for album art that syncs to iOS devices. I wasn’t able to pin this down precisely, because some graphics that were just over 10MB synced, and others didn’t, but it’s safe to say that the practical limit is 10MB. Why would there be such a limit? Since you don’t have a lot of storage on iOS devices, it’s actually a Good Thing. The set that the reader ripped contains about 1,200 files, and if his artwork was all around 14MB per track, it would add more than 1.6GB to the size of his music files. That’s a lot of space for artwork, and on, say, a 16GB iPhone or iPod touch, would be a big hit on the storage. I generally use artwork that’s 600 by 600 pixels—the same size the iTunes Store uses—as I find that it’s good enough to view on an iOS device or an Apple TV, and it doesn’t use up too much space. Q: I have music in my iTunes library that I ripped as far back as iTunes 4. Is is it worthwhile to re-rip my older songs with the latest version of iTunes? Will I have better sounding music or will the files be smaller? Interesting question, and one that I recently pondered. I can think of one reason to re-rip music, and another to not go through the process. If you select a track in your iTunes library, press Command-I, then click the Summary tab, you’ll see which version of iTunes imported them, and which version of QuickTime, the underlying audio framework, was used to rip the file. It’s entirely possible that Apple has improved the efficiency of the encoding process, but the AAC or MP3 formats used haven’t changed since the days of iTunes 4, back in 2003. The oldest tracks I could find in my iTunes library were ripped by iTunes 4.2. You might want to re-rip music if your original rips were at a lower bit rate than what you use now, though I’d suggest doing a blind test to see if you can hear a difference between the old bit rate and the new one, or even between the original encoding and the newer encoding, if you re-rip at the same bit rate. Re-ripping a lot of music is an arduous, time-consuming project. If you have a large iTunes library, you might not want to embark on it. However, if you do want to “update” your older rips, I’d suggest you spend $25 on an iTunes Match subscription first. You can match all your music, find the ones that match from your older rips and re-download them. The files you’ll download are in AAC 256 kbps format. This would save you a lot of time. For files that Match can’t match, you could then re-rip them manually. Unless you ripped the files at a low bit rate, however, I doubt you’ll hear any difference. The only way there would be a difference in file size is if you use VBR (variable bit rate), and the older rips didn’t use this. But the difference will be minimal. 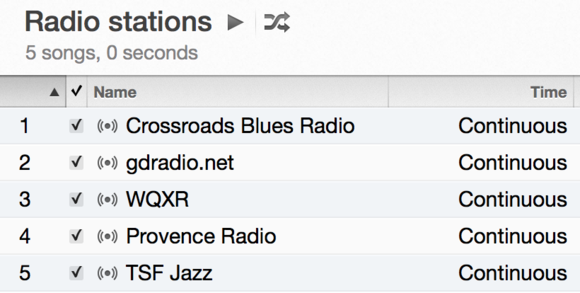 Q: I listen to Internet radio stations on iTunes. Is there a way to save the different stations to one location instead of having to search through a long list of stations each time I want to listen to a different one? Save your favorite internet radio stations in a playlist. Just double-click one to start playing it. Since some of these radio stations are not on 24 hours a day, and some limit the number of streams they can provide at any time, you may find that, when you go to play them, some don't respond.